Hi there! I’ve got a Nail Of The Day post for you today. For this mani I painted my nails with Essence Colour Boots 10 Instant Adventure (1 coat, pinkies and ring fingers) and Hello Kitty Pink (2 coats, middle and index fingers, thumbs). I love the Essence polish. It’s a dark blueberry jelly shade, and I love that it’s a one-coater! The Hello Kitty polish is of poor quality. I had tip-wear after half a day. I wore the mani for 3 days and I had to fill in the tips 6 times! 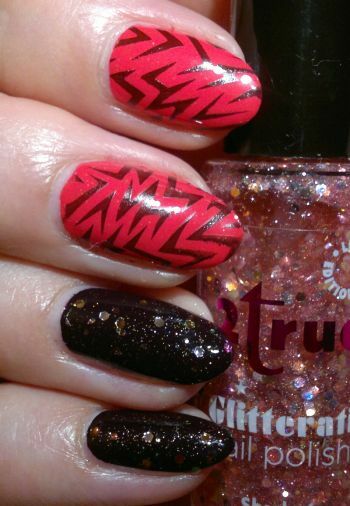 The glitter topper I used on my pinkies and ring fingers is 2True Glitterati Shade 6. This is a great glitter topper. It’s densely packed with glitter and it dries quickly. I used Pueen‘s 83 stamping plate (which is part of Pueen‘s Buffet Leisure stamping plate collection) for the images on my thumbs, index and middle fingers. The black polish I stamped with is the wonderful Revlon Colorstay 270 Stiletto. I did like this mani. The 2 styles wouldn’t have looked spectacular on their own, but I loved how the 2 contrasting styles looked together.